Climbing a Neverending Tree is as Tough as a Kick In the Nuts! Nuts! could have been one of two games. It could have been a crass title in which you punch dudes in the crotch, or it could have been about squirrels literally collecting nuts. Sadly/fortunately, depending on your interest in the pummelling of the male crotch, this one's about the latter. Nuts! came out a few months ago, but I'm playing it this week because it's free in light of the developer's release of something newer. Which is fine by me, because Nuts! is awesome. Unless I'm stuck on a bus or the can for more than five minutes, I want my iPhone games to be fast, pretty and simple, and Nuts! does all three just fine. You control a squirrel running straight up tall trees (actually one never-ending tree), collecting stuff as he goes, by simply tilting the phone left or right. Tilt left and the camera (and squirrel) run to the left of the screen, right and they go right. It's easy, and it's implemented nice and smooth, so you're never complaining about lag or twitchy controls. It also looks great, a clever combination of cel-shaded tree textures and bright, crisp colours in the background giving the game a great cartoon appearance. Those looking for a straight-up, front-to-back experience be warned, though: Nuts! is built on microtransactions, as to overcome the tougher, higher sections of the tree you're almost required to invest in the power-ups and extra lives available in the Nuts! in-game store. 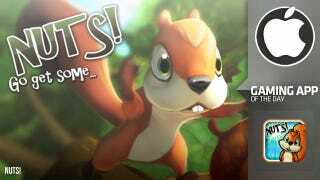 Nuts!, by Limbic Software, is available now on the Apple App Store. You can contact Luke Plunkett, the author of this post, at plunkett@kotaku.com. You can also find him on Twitter, Facebook, and lurking around our #tips page.